For us, it was mostly a good year with memories to last a lifetime. Like always we had our share of apprehensions, uncertainly, tears and despairs but it was also speckled with faith, hope, love and laughter. Hope 2015 brings the same joy, love, health and prosperity to everyone. Growing up, my parents always ensured that all happy occasions are duly celebrated. Be it anniversaries or birthdays or Durga Puja, Christmas or New Year's eve, everything was celebrated with gusto and enthusiasm. One of the things I used to look forward was the New Year's Eve party. Back then New Years Eve celebration did not mean crazy partying. It did not mean cakes and champagne. It meant warms get-togethers with my huge gang of cousins, laughing and giggling, sharing secrets, a lot of "cross my heart and hope to die", innocent fights. It also meant watching the 7 PM news for the round up of the "year that was" and taking notes because we had to write an essay the following day. It meant watching the cultural extravaganza on TV. It meant food galore, with every aunt dishing out their special recipes. It meant my uncles and dad drinking alcohol and us queuing for a bite of the delectable spread of munchies laid in front of them. As I pen-down these nostalgic thoughts, I can almost hear the clatter and din from the kitchen, smell the heavy air laced with spices, deep frying and booze, feel the warm embrace of my cousins! And all it is doing right now is making my heart heavy and welling up my eyes. I cannot thanks my parents enough for giving me such memories to cherish. The highlight of our New Year's Eve party was always the snacks and munchies that used to accompany the booze. I guess even for the guys (read: my uncles and Dad), the paraphernalia was more important than the actual alcohol. And one thing that was most requested was my Mum's Pomfret Fry. Pomfret is a very popular fish and widely available fish in India, especially in the coastal towns and cities. 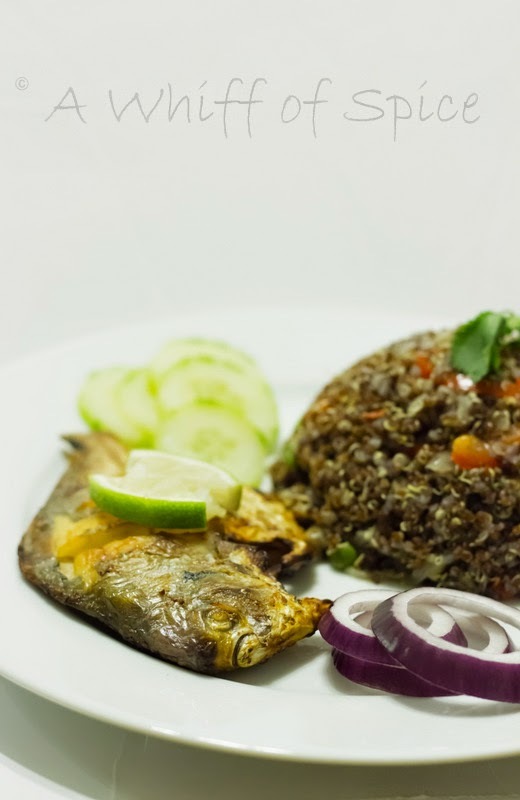 Pomfret recipes vary depending on the region, viz, southern, western and eastern. 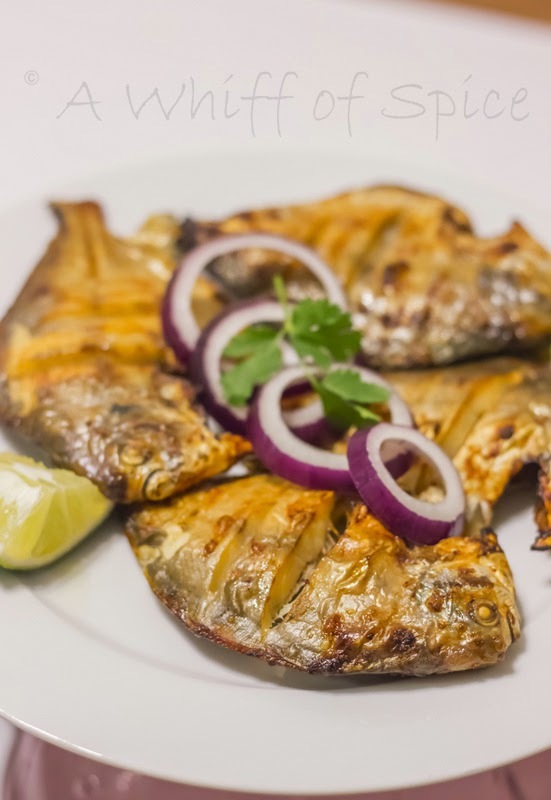 There are mainly three kinds of Pomfret available in India: The White or the Silver Pomfret, the Black Pomfret and the Chinese or the Golden Pomfret. I have always preferred the White/ Silver variety for its very delicate and mildly sweet flavors. My family prefers fresh water sweet fish for their regular curries. Pomfret, which is a sea water fish was reserved for special occasions. 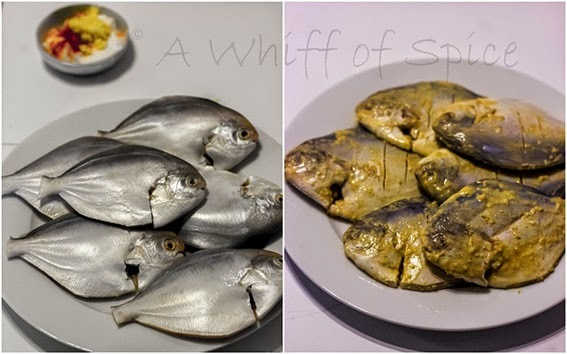 Though gravy dishes for Pomfret exists in Bengali cuisine, it was mainly Pomfret Fry, that was done in my house. Later, when my mum got herself an oven, she used to grill it. Both her Fried and the Grilled version had more or less the same marinade. Tangy yogurt was the base with ginger, garlic and red chili powder providing the heat and flavor. The addition of Tandoori masala was optional. Sometimes she did, and sometimes she skipped. My mom had an aversion to food color and rarely used it in her cooking. Hence her Promfret fry were never fiercely red, like the zillion pics you see on the internet. I guess I have inherited that gene. I have tried to be true to her recipe. The only thing I did differently was to cook it in the oven instead of frying it. In case you want to fry it, here is a little tip from my Mommy. Just before frying, dredge the fish with a light coating of cornstarch (cornflour). This will ensure a crispy, golden crust and the fish will not splutter too much in the oil. 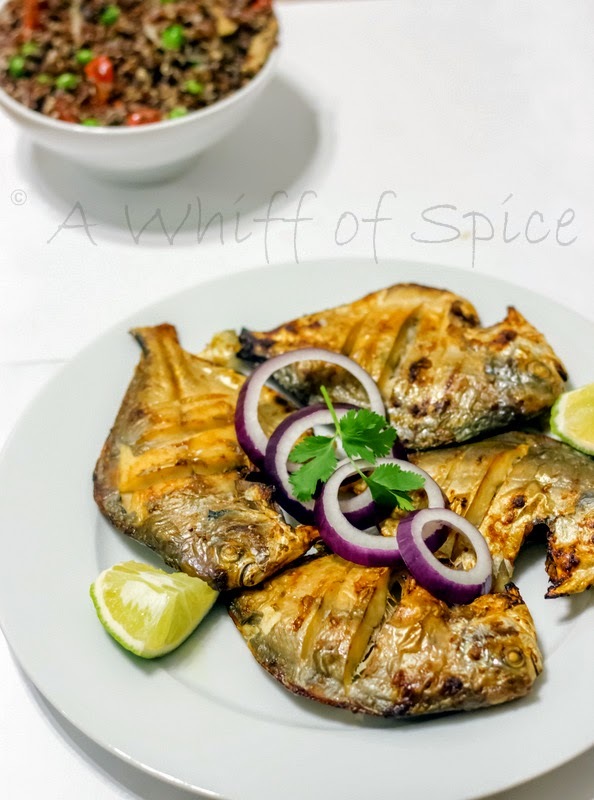 Here is the recipe for our family's eternal favorite; Tangy Oven Grilled Pomfret Fish! 1. Clean the fish thoroughly. The stomach of the fish and the gills should be thoroughly cleaned as well. Dress it by clipping the fins and the tail. You can ask you fishmonger to do that for you. Mine does for a very nominal fee. 2. Score the fish by making deep horizontal gashes on both sides of the fish. This lets the fish cook evenly. 3. Measure out 1/4 cup of salt in a bowl. Rub both sides of the fish very generously with salt. Leave it on for 10 minutes and then wash it thoroughly with fresh water. This steps helps remove any sliminess and the fishy stench from the fish. It also makes the flesh soft and wonderfully receptive to the marinade. 4. While the fish is resting in its salt rub, make a thick marinade with yogurt. ginger-garlic paste, red chili powder, paprika, salt and oil. The paprika is mainly used for giving it a beautiful color. You can add a little store bought tandoori masala. Its gives a very nice smoky flavor. I did not use it because Sid is not too fond of it. You can even add a drop of red food color. 5. 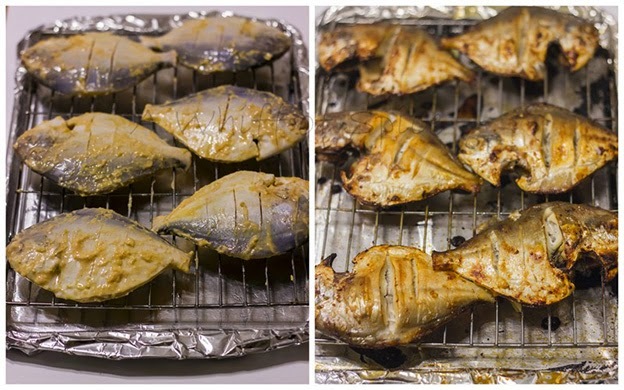 Once the salt rub is washed away from the fish, slobber the fish in the prepared marinade. I find using a zip-lock bag is the best. I add all the ingredients in the bag and squish it around to make a homogeneous mix. Then I add once fish at a time and squish the bag from the outside to coat the fish evenly. It makes a lesser mess. Keep the zip lock in the fridge anywhere from 30 minutes to 2 hours. 6. Once you are ready to cook, preheat the oven to 450 F and cover a baking sheet with foil. Place a cooling rack over it and lightly grease the rack. Cooking the fish over the cooling racks lets the heat go all around the fish. This results in even cooking and no soggy sides. 7. Place the fish on the cooling rack and apply a a light coating of oil with a brush. Grill for 10 minutes. Flip it. Reapply a thin coating of oil and grill the other side for 5 to 7 minutes. White or Silver Promfrets is not a very thick fish and cooks in a jiffy. In case you feel its a little under cooked, put it back in the oven for few more minutes. 8. Serve with a generous squirt of lime or lemon and thin onion slices or rings. Notes/Tip: In case you want to fry it, here is a little tip from my Mommy. Just before frying, dredge the fish with a light coating of cornstarch (cornflour). This will ensure a crispy golden crust and the fish will not splutter too much in the oil. Silver Pomfret also known as zubaidi, butterfish, or Managatsuo in Japanese is a fish that can be found of the East China Sea. Even amongst fish it contains relatively high nutritional value. Raw silver pomfret is said to be hard to come by. Fresh pomfret of this variety are sold at prices that most people would agree to be unaffordable. It is sited to be used in traditional Chinese medicinal due to the fact that it promotes healthy skin along with digestive health benefits. It may be considered good for your skin for its high vitamin A, vitamin B3, and vitamin E content; which give you what you need to fight off wrinkles, skin redness, and maintain moisture in your skin. For advance protection of your skin, it is highly recommended that you consume other foods high in vitamin C and vitamin K to to ward off spots and dark circles as well. Sliver pomfret is an excellent source of B vitamins including vitamin B12 and Niacin. It is lowest in vitamin B2 (riboflavin) in terms of B complex vitamin composition with respect to the % daily value. In every 100 g, it provides 127% the RDI of vitamin B12.